I am a fan of the multi-function printing device. They take up less space than four machines combined (obviously) and I only need to buy supplies for one machine. Time was, however, when owning one meant compromise on all functions. However, about 8 years ago, the first of what I considered good devices in this class started showing up from companies like Cannon, Brother, and HP, and their abilities continue to grow. With the release of Leopard, it is no longer supported by HP software. Oh sure, I can still use the machine stand alone for fax and copies, but all the scanning and faxing from my Mac directly to the printer are gone in Leopard (but not Tiger), basically removing a major reason to own an All-In-One device. Leopard printing is reduced to a no-frills Unix driver that only prints in high quality as well. 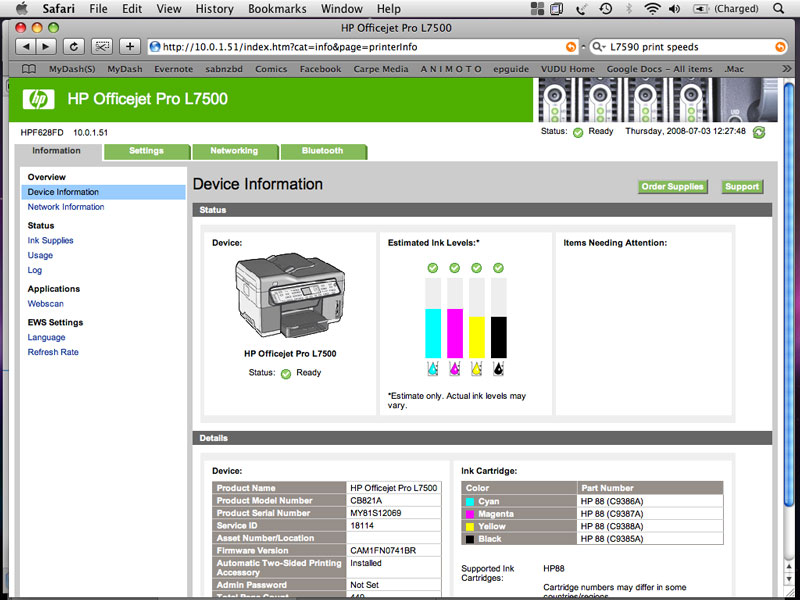 When complaining to HP about the lack of Leopard support, they informed me that my printer was actually over 8 years old and no longer supported (rightfully so), and for about 30% of what I paid for my original machine and interface, I could replace it with a new multi-function machine that was a better at all functions and had networking built in. Today, the HP All-In-One L7590 multifunction device arrived at my front door, and I was excited to get started. At way less than $300, I wanted to check it out. Setting up the hardware was fairly straight forward following the simple graphical set up instructions. All in all, it took about 10 minutes to unpack and assemble, and some assembly is required. Handle the fragile plastic pieces carefully, they seem like they could easily break. Upon turning it on, you are instructed to pick a language, and then the unit goes into self-diagnostic and set up, about 12 minutes of clicking, buzzing, and humming. OK, time for coffee. Upon returning, the machine was now asking for paper. I loaded it up, pressed OK, and was told that another 10 minutes of time was needed for it to align the print heads. It started to hum, buzz, and click again, and I went away for another 10 minutes. When I returned, 3 pieces of paper sat in the output tray with various test patterns printed (and checked internally,) and the display confirmed that all was set up and ready to go. Those 30 minutes seemed like a long time to get a printer ready, and it is not truly ready yet, but they assure excellent print quality. Next is installing the software from the included CD, except the CD in the box is not ready for Leopard (10.5). Uh, didn’t they tell me this was a Leopard ready printer? No problem, off to HP’s website, which is rather good for finding drivers and software updates, and locate the newest drivers. So, maybe not so good after all, as the choices were a bit confusing. There was a download dated 04-2008 marked version 8.0.1. But, there was also another one, dated 2 months earlier, with version 9.7.1. So which to pick, the newest revision or latest date? Turns out, take the highest revision number and you will be OK. If you are not on a high speed internet however, you may want to call HP and see if they will send you a CD, as this download is 225.44 Meg, which took over 10 minutes on my 6 Mbps DSL line and will take an hour or more on a 1.5 Mbps DSL., up to 6 hours if you have 384K standard DSL, and a VERY long time on dial-up internet. Install is a bit convoluted. The installer will take you through the basic install of the HP software just fine, but then you are instructed to manually add the printer to the computer using Apple’s Print & Fax program. And here things get a little complicated. You are instructed to open Print & Fax, and when it opens, your printer will not show up. So, press the + to add a new printer (you may have to unlock the dialog by entering your password first) and you will be presented with the add printer dialog. Press DEFAULT, and almost immediately this printer will appear in the list of printers as a “Bonjour” printer. DO NOT SELECT THAT ONE! You have to wait for the IP version of this printer to show up (which the instructions do not tell you), which it will eventually (30 seconds to several minutes) using a cryptic name like HPF628FD, but listed as an HP IP printer. That is the one you want to select. If you choose the Bonjour printer to proceed, things will not go well, and you may have to start all over again. Now, select the IP version of the printer, give it a more usable name if you like, and press Add. The program will query the printer for options (which takes a minute or so) and then adds it to your list of printers as the default. You should be done. Well, you should be, but you are not. Now you need to close this window and return to the installer dialog, which is waiting for you to do all that stuff, and finish. There are a few steps for registering the printer, and then you are done. When the big green check circle appears, you should be ready to go. Not exactly the simplest device I have ever installed, and the software install took a rather long time too, as this All-In-One comes with a lot of great supporting software for faxing and scanning in addition to printing and photo management. And, if you make a mistake during this install, you will end up with a lot of software that will not work correctly, and may require that you delete it all and try again to make it right. This was not a novice install process, and not very Mac friendly. On several computers running 10.4, all was not well with the install using the included CD either, hanging half way through the install. I did a force-quit and tried again with similar results. Long story short, it seems that other HP software may get in the way and stop or corrupt this install. On one machine, for example, that had an HP photo printer installed, this new printer would only allow me to print on Photo Glossy paper after installing this printer. Bottom line, if the install fails, try uninstalling ALL other HP products, reboot, and try again, as this fixed it for me on Tiger and Leopard. I did not retry the install with the downloaded installer on Tiger as it was now working, but perhaps they fixed some of these issues. As a side note while playing with the installers: Once the printer was powered on and on the network, I did notice that Bonjour recognized the printer in the Printer Browser dialog on both Tiger and Leopard. However, Tiger could not find a driver to use for the printer and failed to install. While Leopard did find and recognize the printer in Bonjour, and said it had a driver, it refused to actually print anything after installing with this method. The printer “application” would launch, but failed to open any windows, or print. I spent a great deal of time with HP on the phone, and after a lot of work, and their latest release of the software, removing ALL HP software already on my machine, it all seemed to install just fine. So now, after all this “fun”, how does it actually work? Physically, the printer seems less “sturdy” than my previous HP model, and while fairly heavy, still seems to creek, shake and rattle a lot when printing. It also shakes the table quite a bit (a large, solid wood kitchen table), a factor I chalk up to the speed of the printing. The print heads are moving so fast, they tend to impart inertia into the table, so be sure to put it on a sturdy surface. The sheet feeder for copying is also noisy, and the whole unit seems a bit more “clunky” as my wife put it, than our previous printer. The printer overall is a LOT noisier than my previous G85 too. So much so, that printing while talking on the phone was impossible. This is a real problem in my view, because this will typically sit in the office near where you work. It also takes up a bit more desk space, but not a significant amount, sitting in at 20.67” x 18.35” x 14.02” and 34.26 lbs. Some of the plastic parts also worry my a bit. For example, the input sheet feeder tray easily pops off the printer if you press on it lightly, and feels as if moving it will break it. The same is true for the sheet tray for output, and the doors for the ink cartridges. In fact, when replacing an ink cartridge on one of the printers we tried, the door for the ink bay did break off, and had to be taped back in place. The front panel control panel is good, with separate button for each of the Copy, Fax, and Scan functions, as well as a set of general control buttons. 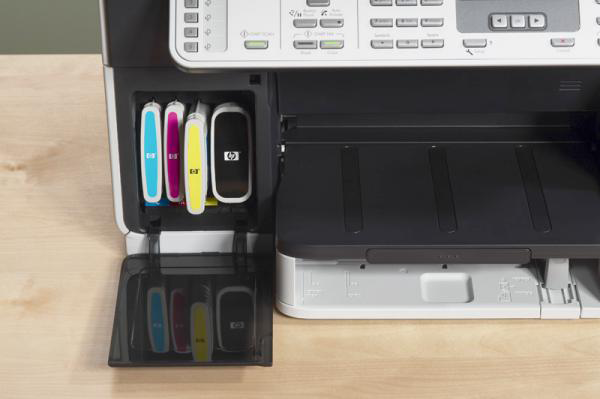 The front LCD display is reasonable enough, showing the remaining ink in each cartridge, as well as the printer status, fax phone number, and other status info. This display is also for displaying preferences when setting them from the panel buttons. More expensive versions of this printer family include a color LCD display for viewing photos as well. All versions have built in Ethernet, and work with Windows and Mac at the same time. The top end of this line (L7780) also has 802.11 wireless is built in, but save your money here. I tested two L7780 printers, and both had serious 802.11 radio problems making the feature worthless. My first test was to put a full color picture on the scanner glass and copy it. I tried it in draft, normal, and best modes, each mode taking longer than the previous to copy the picture, and each producing much better results than the one before. The first improvement I noticed over previous models was that the copier stopped copying as soon as it reached the end of the photo, instead of copying the entire empty glass as well. And in draft mode, I got a reasonably good copy (albeit a bit light in color) with great resolution in less than 10 seconds. In ‘best” mode, the copy was amazing, and very close to the original. A full-page copy of text, my second test, took less than 5 seconds to copy in B&W draft mode, and was truly indistinguishable from the original. The top fully opens on this device to make copying books and large items on the glass very easy. Copying a stack of documents with the sheet feeder works well enough too, but the mechanics of the sheet feeder are slow compared to printing, and again, quite noisy. But now this unit will do true two sided copying in various modes, including all 1 sided pages to 2 sided pages, 2 sided pages to 1 sided pages, 2 sided pages to 2 sided pages, and of course, 1 sided pages to 1 sided pages. And while the paper handler is slow and noisy, do you really care if you do not have to feed it by hand? As for handling the paper, it did it flawlessly. Printing on this device is truly amazing, and just about makes up for all the other problems. Just about. The quality of this printer is well above any printer I have used in a similar price range, and it is amazingly fast, especially in draft mode, which prints good quality pages using very little ink, and lightning speeds of up to 35 ppm black or 34 ppm color. In the normal and best mode, the printer takes longer per page, but the print quality is even better. On photo paper, the prints looked very good as well. Using HP paper with factory inks, photo results were outstanding and are supposed to have a very long shelf life as well. Two-sided printing works well enough, but it does slow the printing considerably, as the first side has to dry before printing the second side. Flipping the page also takes a while. That said, using two sides printing does save a lot of paper, and in draft mode, can still print both sides in 20 to 30 seconds. The fax functions are on par with a stand-alone fax machine, and faxing can take place from the sheet feeder, the glass., or directly from your computer using “print to fax.” If using the sheet feeder, you can even choose to send 2-sided fax pages preceded by a 1-sided cover page, a nice option. The fax includes all the usual auto-redial, variable speed, and HP’s color fax system that make this a complete fax solution. On the incoming fax side, there are a great number of features, including (if you have caller ID) a junk fax blocking control. Faxes will print straight away, or if out of paper or ink, hold in the unit. But my favorite feature is the ability to use this machine on a single shared voice/fax phone line. If you have distinctive ring, this machine can answer when it hears the proper ring pattern. But better still, when you phone is “off hook”, this machine listens to the phone line, and the touch-tone code “1” “2” “3” instructs this device to start receiving a fax. What that means is your answering machine message can now tell callers to punch 1, 2, 3 and start their fax, and the fax machine will take over the call. Or, if you happen to answer the phone and hear a fax tone, simply press 1, 2, 3 on your own phone, and the fax machine will take the call and start receiving the fax. Of course, if on its own phone line, you can have the fax machine automatically answer after a preset number of rings. Another thing I truly appreciate about this printer is that it uses 4 separate ink cartridges that come in both standard and extra large capacity sizes. This means no more throwing away two partially full colors because one color went empty on a single 3-color cartridge. In addition, the cartridges do NOT contain print heads, so refills are significantly less expensive. But fear not, while you should not need to replace the print heads any time soon, both heads (one for black and yellow, and one for cyan and magenta) can be replaced separately if needed. The few software issues aside, this printer comes with a fairly good set of printer utilities., way too many to cover in detail here. 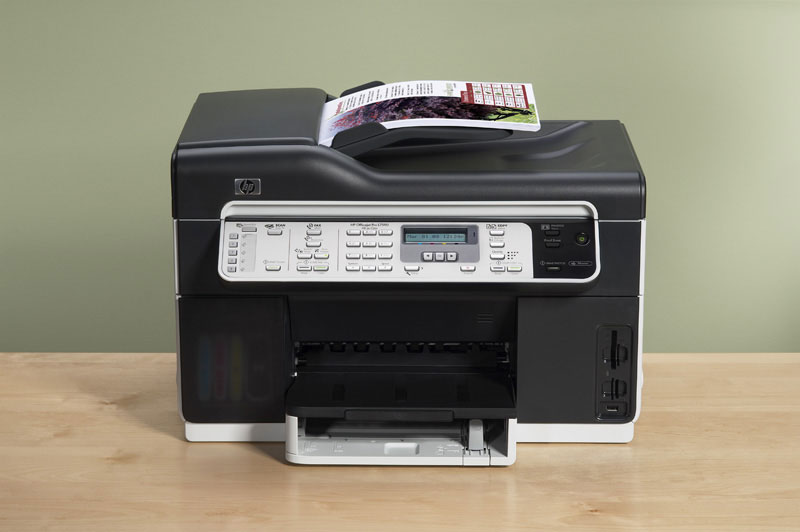 They include uploading images from the built in memory card reader, scanning a picture, scanning to an OCR program (included), scanning directly to a PDF, sending a Fax from your computer, and viewing printer messages remotely, and a number of utility programs for maintaining and setting the printer options. 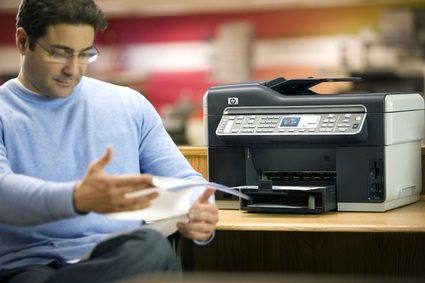 HP’s software still appears to uses printer polling, meaning that your computer is constantly asking the printer if all is OK, which means there is a small amount of overhead when this printer is installed, but insignificant most of the time. And because each computer is polling all the time, each will also tell you when a printer “problem” occurs, which I find annoying. For example, when the printer runs out of paper or ink, EVERYONE who is running the HP Device Manager gets a message about this “problem.” Even simply opening the scanner top causes everyone to see a “Printer Top Is Open” message. Dumb! There is also an embedded web server in the printer for setting options, checking ink, and using the scanner, should you want to access this printer from a machine that does not have the software installed. Overall, this printer disappointed me. HP usually makes great printers, and the new features on this one over my older All-in-One sounded fantastic. But in reality, the loudness of the device coupled with the “flimsiness” in feel made this printer less desirable for me. I could have forgiven most of this had it worked flawlessly, but serious issues with the Mac software were also a negative in my view. As a standalone copy and fax machine, this device is truly amazing, and as I said, the print quality is better than any printer I have tried, especially at this price. From Windows (XP) it worked flawlessly, but from my Macs, the software still needs some work in my view. Bottom line, if you can deal with the noise, and HP’s newer software releases resolves these issues (given HP’s track record, I believe they will), then this is an amazing printer for the money and will work well for you. Pros: Amazing printing quality and speed. Good scanner. Great fax features. Separate color tanks for each color. Separate print head from ink refill keeps refill prices lower. Inexpensive price for an All-In-One. Cons: Noisy. Cheap feel due to plastic used in construction. Issues with software installing as well as software conflicts if any other HP products were installed on your Mac. Annoying messages when not using printer. Slow, noisy sheet feeder. Oh, and did I mention it was noisy? Conclusion: A large number of features for the money, great copy, fax and print functions and quality, but noisy, clunky, and software problems are an issue.